The origins of classical ballet extend back to the Renaissance period when dance became an inseparable part of court rituals and a symbolic expression of political ideas. Dance embodied the ideals of a harmonious society governed by celestial spheres and dominated by grace and beauty. In the early court ballets, kings and queens participated in the performances alongside with their courtiers and professional dancers. Before the establishment of the first professional Academy of Dance in seventeenth-century France, Italians were the most acclaimed teachers and theorists of dance in Europe. The very word “ballet,” which is used in today’s English in the French spelling, had its origin in the Italian balletto, a diminutive of ballo(dance), which in turn comes from the Latin ballo, ballare, meaning “to dance.” The five schools of classical dance presented in the Gala—French, Russian, Danish, British, and American—demonstrate a sequence of historical canons, which never existed in isolation from each other, but rather were intertwined and enriched each other. These historical canons did not remain frozen in time but continuously contribute to many excellent ballet schools around the world today. These schools empowered classical dance to grow through the centuries and now to renew their historical achievements in relation to contemporary world. The training of a classical dancer is a long and demanding process, in which physical and expressive, technical and artistic, traditional and innovative aspects come closely together. It is often said that dancing requires a harmony of body and soul. This harmony is not arbitrary. Any movement or pose in classical ballet is harmonized through a position of arms, a direction of gaze, a tilt of a head, and a height of extensions, among other factors. All these important aspects are interpreted differently in the various schools. These differences are grounded in centuries of performing traditions, theoretical writings, aesthetic preferences, and cultural contexts. Although each of these schools strives to instill in a physically singular body a certain imprint of a school’s uniform manner of executing steps or holding positions, the paradox is how they enable the development of creativity and expression within strict parameters of a system. When Henri II, the future French King, married the Florentine princess Catherine de Medici in 1533, he could not have predicted that his Italian wife would bring to France at least two unquestionable cultural treasures—a taste for court ballet and her exquisite library. Court ballet found a fertile ground in France, where it became tightly linked with the court etiquette. Louis XIV, dubbed as the Sun King in association with the Greek god Apollo, was a gifted and passionate dancer. The foundation of the Académie Royale de Dance in 1661 was one of the earliest decrees that the young king signed after becoming an absolute monarch. This decision had a long-lasting influence on the tradition of dance everywhere in the world: dance became an art supported and cultivated by the state. The king charged his Academy of Dance with the task of systematizing the technique of dance and teaching it to his courtiers. Only highly qualified teachers, who were given the titles of academicians, were allowed to give instruction in dance in France. Working side by side with the foremost writers, poets, composers, painters, and sculptors of seventeenth-century France, the ballet masters of Louis the XIV’s period transformed dance from a leisure practice into a professional occupation of intellectual depth, artistry, and technical agility equal to those of other creative arts. Pierre Beauchamps, the first director of the Académie, a famous dancer and choreographer, developed a system of dance notations for his numerous choreographic creations at the court and invented the system of the five basic positions of the feet, which is still used in ballet today. In 1672, the Academy of Music under the directorship of Jean-Baptiste Lully amalgamated the Academy of Dance. The two joint academies founded a performing company, the Paris Opéra. In 1713, the Conservatory of Dance at the Paris Opéra began to admit younger students with the purpose of training them for the corps de ballet of the Paris Opéra. The special examination system ensured the progress of its students and their passage to upper levels of training. This model influenced other European schools of dance. During the three centuries of its existence the school produced many outstanding dancers. Its technical clarity and stylistic purity developed in close proximity with the productions of the Paris Opéra, which featured such outstanding dancers as Jean Balon, Louis Duport, Marie Camargo, Gaetano and Auguste Vestris in the eighteenth century and then Jules Perrot, Arthur Saint-Léon, Fanny Elssler, and Carlotta Grisi in the nineteenth. The legendary ballerina Marie Taglioni joined the Paris Opéra in 1832 with her signature role in the ballet La Sylphide. In her retirement years, Marie Taglioni, an exemplary technician of dance, started the tradition of the master class, which she gave to the advanced dancers of the Paris Opéra. The terms applied to positions and types of movements developed in the French school remain the lingua franca of classical ballet of today. The clarity of position and effortless passage between them, the maintenance of a strong axis in a dancer’s body, which allows for an elegant refinement of steps, stability of balances, and regal interiority of emotions remain the distinct features of the French school. Classical dance came to Russia soon after the Westernization of Russia brought by the reforms of the tzar Peter the Great. In 1738, the Empress Anna established the Imperial Theatrical School and installed the French teacher Jean-Baptiste Lande as its director. The Academy was located in the Winter Palace and trained young boys and girls at the expense of the state, preparing them for the Imperial Russian Ballet, a direct predecessor of the fabled Mariinsky Ballet of today. Classical dance became one of the most preferred forms of art among the Russian public. The rapid development of the Russian school in the eighteenth and the nineteenth centuries is credited to the confluence of several European schools and the cultural cosmopolitanism of the Russian capital. The French masters, such Charles Didelot, Jules Perrot, Arthur Saint-Léon, the Italians, such as Pierina Legnani, Carlotta Brianza, and Enrico Cecchetti, the Danish Christian Johannson, a student of August Bournonville, all worked side by side with Russian performers and choreographers. In 1847, Marius Petipa, the legendary French dancer, choreographer, and teacher, took the position of premier danseur to the Imperial Theatres of St Petersburg. It was a magisterial event for the history of Russian and world ballet. In his sixty-year long career in Russia, Petipa created the best-known ballets of today’s classical repertoire, such as Don Quixote (1869), Le Bayadère (1877), Sleeping Beauty (1890), and Raymonda (1898) among others. He perfected the structure of a narrative ballet by allowing dancers, particularly ballerinas, to showcase their technical virtuosity in the impeccably structured pas de deux and variations. His corps de ballet scenes recalled magnificent tableaux vivants by creating the illusion of a veritable theatrical mystery. Some of Petipa’s best dancers, such as Nicolas Legat, and especially Agrippina Vaganova, successfully converted themselves into remarkable teachers, who summoned their stage practice and elaborated it into a system of training. Agrippina Vaganova, who performed with the Imperial ballet as a sujet dancer, played a particularly transforming role in the history of Russian and world ballet. Her exceptional pedagogical and organizational skills helped to preserve the best parts of the Imperial school’s tradition through the years of the Communist regime in Russia. Vaganova taught in the Leningrad State Choreographic School, now the Vaganova Academy of Russian Ballet, from 1920 till her death in 1951. In 1948 she wrote a treatise The Principles of Classical Dance, which remains foundational for many schools worldwide, based on her method. At the core of the Vaganova system is the idea of a progressive (through seven or eight years) training of a dancer’s body with a particular emphasis on the strengthening of the core, elongation of limbs, and articulation of the dancers’ feet with the aim of reaching an expressive coordination between the movements of the upper body and the legs. This idea of coordination in a dancer’s body, further supported by the integrated musicality of movements, contributes to the visually beguiling plasticity and expressiveness of dancers trained in the Vaganova method. This method remains at the heart of the Moscow State Academy of Choreography (or The Bolshoi Ballet Academy) and many other ballet schools established by the Vaganova students in the former Soviet Union and numerous countries throughout the world. The rise of the Danish school of ballet is inextricably linked to August Bournonville (1805-1879), an outstanding choreographer, teacher, and theorist of dance. Born to a French father and a Swedish mother, Bournonville received the French training from the famous dancer Auguste Vestris, who raised the level of technique for male dancers to a new level. In Paris, Bournonville also absorbed the spirit and aesthetics of Romanticism, which dominated European culture in the first part of the nineteenth century. He opted, however, for spending his life in Copenhagen, in the Royal Danish Ballet, which he directed from 1830 until his death and for which he created about sixty ballets. Bournonville’s restaging in 1836 of the already acclaimed La Sylphide choreographed by Filippo Taglioni for Paris Opèra in 1832, revealed a specific vision that the Danish choreographer brought to the late Romantic ballet. Bournonville’s Sylphide was not a wispy creature and an ethereal beauty but a more a concrete, physical instantiation of the supernatural, both folkloric and poetic. Lucile Grahn (1819-1907), the fabled Danish Sylphide, danced this role with restraint and simplicity, which brought her closer to characters from the real world, interpreted in the Danish version with a warm domesticity. Accordingly, Bournonville changed the dreamy and ephemeral choreographic structures of the French version to a dance in which the main characters addressed each other through movements. Bournonville’s choreography was more technically challenging for men and women alike but at the same time it restrained dancers from any forced ornamention, exaggerations, and unmotivated fixation on poses. His other famous ballets, which remain in the repertoire of the leading ballet companies, such as Napoli (1842), The Conservatoire (1849), and The Flower Festival in Genzano (1858), for example, created worlds populated by ordinary people rejoicing through dance. Bournonville did not use classical mythology or history for his ballets but preferred the Scandinavian folk tradition with an emphasis on moral values and ethics, making his ballets accessible to all levels of nineteenth-century Danish society. Bournonville inherited from Vestris, his teacher, many technical secrets of the male dance which were subsequently lost in the French nineteenth-century ballet. Mostly, he refused choreographing ballets only for the ballerinas on toes. His danseurs and danseuses executed dynamic jumps, pirouettes, entrechats, and other elements of bravura technique with fully extended knees and turned out legs, as dancers of today. Bournonville’s stylistic singularity is particularly evident in the dignity and clarity of poses and a graceful épaulement based on a lower position of the arms. He recommended avoiding distortions or overextensions of extremities beyond the normal anatomical structures of bodies. In his theoretical writings, he advocated dance as an unpretentious and unnatural expression of human soul. Bournonville’s allegro movements necessitated extreme quickness and precision of legs, as he always emphasized the flow of choreographic phrasing. The requirement of executing movements with a natural ease, as if holding a conversation in ordinary language, which classical dance is not, put an additional physical requirement on dancers trained in the Bournonville system. The master’s immediate students assembled his lessons into a sequence of daily exercises for each day of the week, which is still in use in the School of the Danish Royal Ballet. The Bournonville style influenced many choreographers outside Denmark, most notably George Balanchine. Erik Bruhn, a brilliant student of the Bournonville tradition and a celebrated twentieth century-dancer, brought the letter and spirit of this historical tradition to the National Ballet of Canada, which he directed in 1983-1986. The Russian factor had a particular influence on the formation of the North American school of classical dance. Anna Pavlova’s appearance at the Metropolitan Opera in New York in 1910 and on the first North-American tour of Les Ballets Russes in 1916 won the hearts of the North-American public with this art of royal origins, which had no historical footing in the United States. The formation of the two leading American repertoire companies — Ballet Theater (became later American Ballet Theatre) in 1939 and the New York City Ballet in 1948—was instigated by Russian émigrés working with Americans. The latter company is inextricably linked to the legendary name of George Balanchine, the world-famous choreographer who pushed the limits of classical dance to new heights. George Balanchine, born Georgii Balanchivadze in Saint Petersbourg in 1904, studied in the Imperial Ballet School, where as a schoolboy he performed in the glamorous productions of Marius Petipa. After the Communist Revolution in Russia, Balanchine began experimenting with the avant-garde forms of dance; he borrowed elements and movements from jazz, acrobatics, folk dance, and eurhythmics. Escaping from Russia in 1924, Balanchine settled in Paris, worked in London, Copenhagen, and New York, collaborating with different ballet companies, from Les Ballets Russes to Paris Opéra, and worked for popular entertainment venues and film productions. This welter of experience prompted the idea of establishing a new type of a classical ballet company, one that would follow a tradition of its own, and that would express the dynamism, complexities, and optimism of the twentieth century at its fullest. His ideas resonated with Lincoln Kirsten, American philanthropist, impresario, and art connoisseur, who invested his fundraising skills and personal capital, into the creation of the New York City Ballet, to which he served General Director from 1946 to 1989. Before launching a full repertoire company, Balanchine and Kirsten put their effort into creating the first institution for teaching classical ballet in the United States. Balanchine’s unbendable decree “But first, a school” proved to be visionary, and the School of American Ballet, which opened its doors for 34 students in January of 1934, became one of the finest classical ballet schools in the world. The SAB’s first teaching staff was predominantly of Russian background then, as Balanchine believed in the system of training, which had already proved its coherence. The results of training in the SAB, though, fostered different types of dancers, those tuned for Balanchine’s choreography with its different musical, spatial, and anatomical demands. Balanchine never composed a ballet in the abstract but always worked with the particular dancers, changed and revised his choreography for new generations. Balanchine created about a hundred ballets during his long career, from which extracting a single style would be an impossible task. 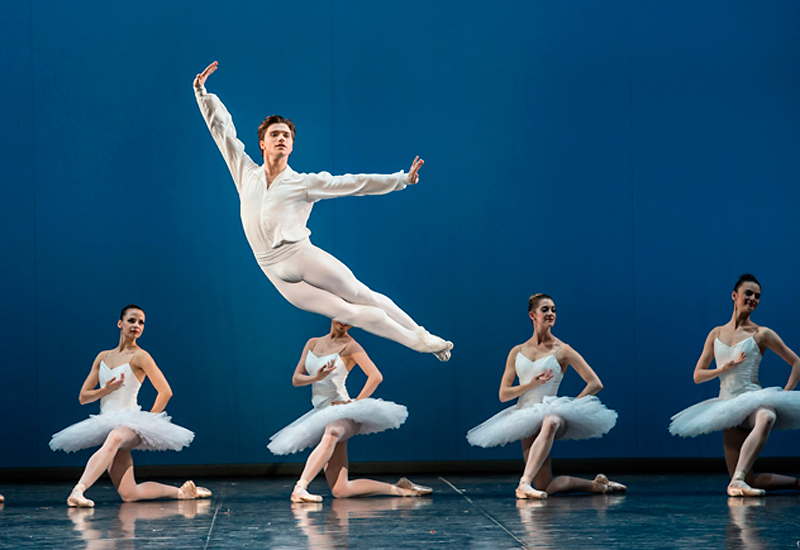 Balanchine’s choreographic principles and stylistic preferences, however, can be traced more consistently from his earliest neoclassical ballets, particularly from Apollo, choreographed in 1928, to the original score by Igor Stravinsky. First and foremost, Balanchine’s neoclassical interest in the unlimited expressiveness of bodies was paired with the modernist preference for minimalism and abstraction in plots, sets, costumes, and lighting. Another important aspect of the Balanchine style contained in his attitude towards music: his dancers do not move with music, they are the music, which they visualize by movements. Famously, Balanchine preferred composing his ballet to the non-traditional balletic music, although he restaged some of the classical ballets, such as Sleeping Beauty orRaymonda for his company. His work with Igor Stravinsky was an exceptional case of a modernist paradigm of collaboration between the arts. Accordingly, the schooling in Balanchine style required from students an absolute precision in their footwork, speed, and spontaneity in incorporating space in movements of dancers on stage. Preserving the integrity of the classical vocabulary of poses and steps, Balanchine’s style allowed for crossing the strict limits of classical training by pushing the balances slightly out of axis, by liberating the hinges of the lower body and heightening arabesques and attitudes, and by bringing to the classical dance an elegant athleticism of movements, which was unseen before.